He's a vampire bad boy. She's a slayer's daughter who's never been kissed. 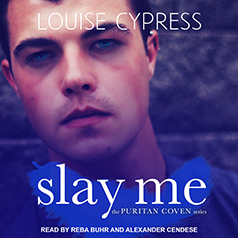 Kyle Logan has been a sixteen-year-old bad boy for three years, ever since he became a vampire. After a stint at the rehab center run by the Brothers of Temperance, Kyle has finally kicked his blood addiction. Now, he's back in high school with one goal in mind: stay clean so that he can grow up and become an animal rights activist. Cassandra Xander wants two things in tenth grade: a car and the chance to attend a traditional high school. She loved being homeschooled growing up, especially since her family moved every six months for Helsing Incorporated, but now that her mother is founding a slayer training academy in La Jolla, California, Cassandra is excited by the opportunity to attend La Jolla Cove High. When Kyle witnesses Cassandra give a verbal reckoning to a dog owner who leaves her beagle locked in a sweltering car, Kyle makes his move. He loves that Cassandra is smart, intense, and willing to break rules. But Cassandra has zero experience dating and isn't sure that a relationship with a hot-tempered vampire is a good place to start—especially when she discovers Kyle's secret ability. Kyle works hard to master his emotions and make all of Cassandra's high school dreams come true. Just when their romance brightens both of their lives, Kyle's past draws him back into darkness. The only way forward for these high school sweethearts is to slay or pay.